M. Graham is known for the unique formulations and the exceptionally high quality of their paint lines. If that wasn't enough, they've now given you one more reason to love their brand: while supply lasts, buy any 3 tubes of either Gouache, Watercolor, Acrylic, or Oil, and get 1 tube ABSOLUTELY FREE! Click each paint category below to learn more, including the list of available colors and pricing. Free Tubes are available at the till. Limit one per customer per transaction. Select colors available as promotional giveaways. 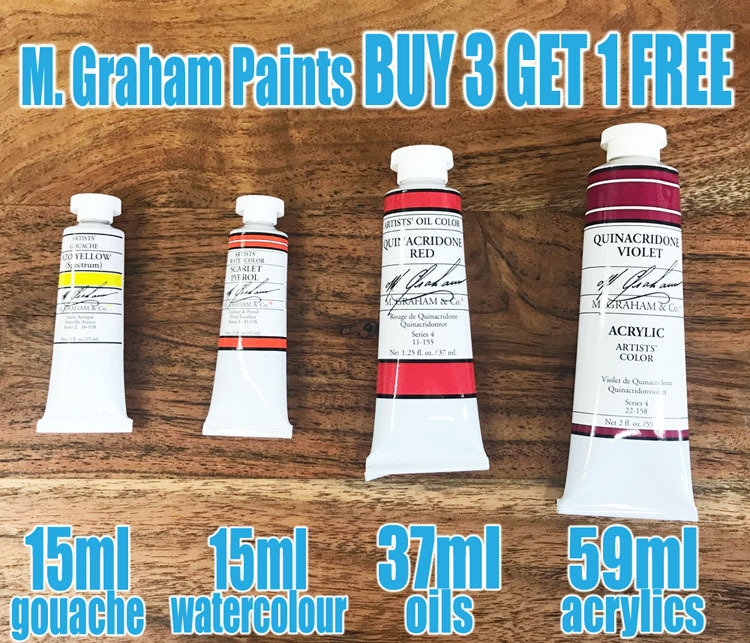 Customer must buy 3 tubes of one paint line (acrylic, watercolor, oil, or gouache) to receive one additional fourth tube of the same type at no extra charge. Offer valid while supply lasts. FREE tubes available while supply lasts. Check out our products page for more info on all of the items that we carry. For questions about our products or monthly sales please call (306-664-3931), e-mail, or stop by the store.